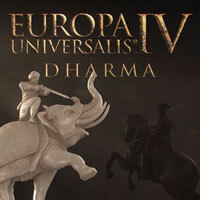 Dharma is a DLC to Europa Universalis IV, a popular real-time strategy game. The game focuses on the Indian subcontinent. This is Europa Universalis IV expansion pack. Europa Universalis IV: Dharma is yet another DLC expansion for the game Europa Universalis IV, which is a historical RTS game with a huge gameplay scope. The original game was released in 2013. As with the base game, the authors of the Dharma expansion are Paradox Development Studio. The Expansion is not a stand-alone game; players need to have the base EU IV in order to run it. Although Europa Universalis IV: Dharma focuses on the Indian subcontinent, it also introduces many general improvements to the base game. The main goal of the creators was to make peaceful periods more entertaining to play through, hence the new enhancements in both management and the economic system. The most important kingdoms and sultanates of the peninsula received specially designed mission trees. The immersion is further enhanced by the unique factions in the Estate system: when playing Indian countries it is possible to interact with five new castes or groups, such as the Brahmin or the followers of Jainism. Members of those exotic groups can provide useful services, e.g. by increasing the income of a province or by calming down its inhabitants. As the leaders of the Mongol Empire, we can assimilate conquered peoples swiftly and with ease. Western countries can now use new the mechanics related to trading companies. In distant lands, such as Africa and Asia, the creators have established chartered trade zones, where it is possible to buy new lands. Provinces related to our trading companies, as well as trade centers, can now be upgraded for additional benefits. Players are given greater freedom in shaping the political system of the chosen country. The form of governance can be changed by introducing reforms, which result in specific bonuses and affect the factions of the Estate system. Now everybody who owns a copy of Europa Universalis IV: The Cossacks DLC can play as the leader of the new Cossack government. Dharma also introduced a number of smaller novelties, such as the monsoon season, new ways of suppressing uprisings, new things to do with colonists, and so on. Expectations: 8.0 / 10 calculated out of 7 players' votes.